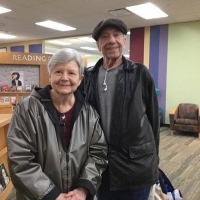 Friday, Nov. 30, wasn’t a typical day at Porter Library for Elaine Maurer. Just after she checked out, a voice came over the loud speaker announcing that she had just made the one millionth checkout of 2018. Library staff presented her with a nice gift bag in celebration. Congratulations to her and congratulations to Porter Library and all of its patrons in achieving this wonderful milestone. Mel Maurer lives in Westlake.